210 of The Bombe were made, which weighed about a ton each. Click on the image to watch it in action. The Bombe, a machine developed at Bletchley Park during World War 2, has been voted the engineers’ favourite in a new survey to mark the 30th anniversary of the Engineering Heritage Awards. Members of the Institution of Mechanical Engineers have voted the Bombe as their favourite Engineering Heritage Award winner in a new survey. Engineers were asked to vote for their favourite recipient of an Engineering Heritage Award ahead of the 30th anniversary of the Awards scheme and the presentation of the 100th Award to the Old Furnace at Ironbridge, which is cited by many as the birthplace of the Industrial Revolution. The awards, established in 1984, aim to promote artefacts, sites or landmarks of significant engineering importance – past and present. Members were asked to vote for their favourite of the 99 artefacts already in receipt of one of these awards. The Bombe achieved over 19% of the vote, closely followed by Concorde with almost 17% of the vote. The Bombe was an electromechanical device designed to help crack the German Enigma code during the Second World War. All of the 210 Bombes built by the British Tabulating Machine Company during WW2 were dismantled after the war but a fully-functioning replica, on display at Bletchley Park, was completed in 2007. The replica was rebuilt over the course of 13 years by a group of enthusiasts, led by John Harper, using the original blueprints. The Bombe was the brainchild of mathematicians and codebreakers Alan Turing and Gordon Welchman, who then passed on their concept for design and construction to Harold Keen, an engineer at the British Tabulating Machine Company. 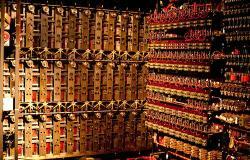 The machines allowed up to 5,000 messages a day to be decoded and were pivotal to the Allied Forces winning the war. The Bombe became the 49th recipient of the Engineering Heritage Award on 24 March 2009. “The 210 Bombes built by the British Tabulating Machine Company during World War Two played a crucial role in the Allied success in the war. “Estimates suggest that they could have helped cut the war by as much as two years – saving countless lives. “These machines, which each weighed about a ton, illustrate the genius of Alan Turing and Gordon Welchman, but also the vision and ingenuity of the engineer Harold Keen who made these concepts a reality. “As with all major volunteer projects it is not the leader who deserves the credit for what has been achieved but the whole team who did all the work. The survey was conducted to mark the 30th anniversary of the Engineering Heritage Awards and also the 100th Award, which was presented to the Old Furnace at Ironbridge, cited by many as the birthplace of the Industrial Revolution, on 10 October 2014.